Work on Broomy Lane – passing Places. Posted on January 2, 2019 by Richard Loader	in Our Roads and Road closures (temporary). 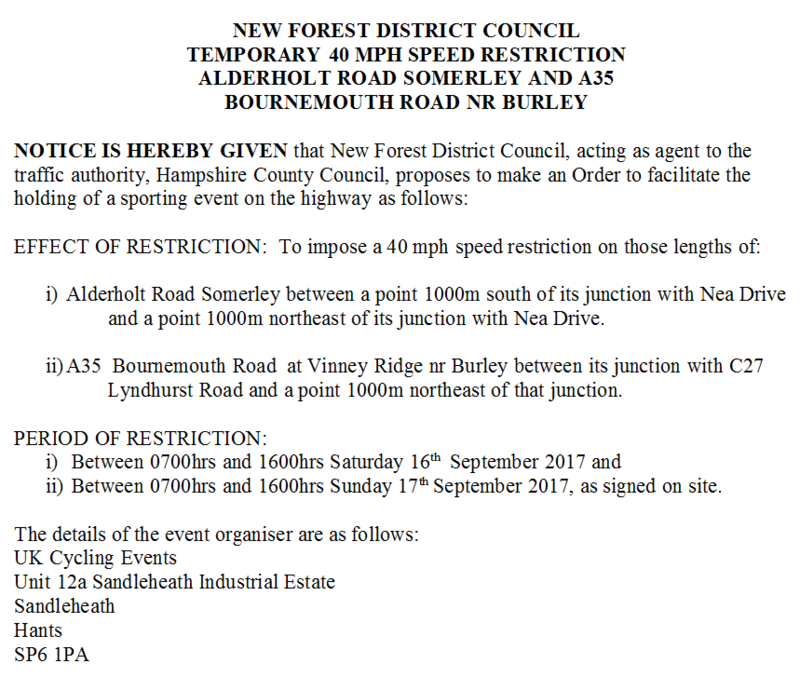 This could be interesting – hopefully an experiment with single track style passing places – an effort to slow traffic and preserve verges. 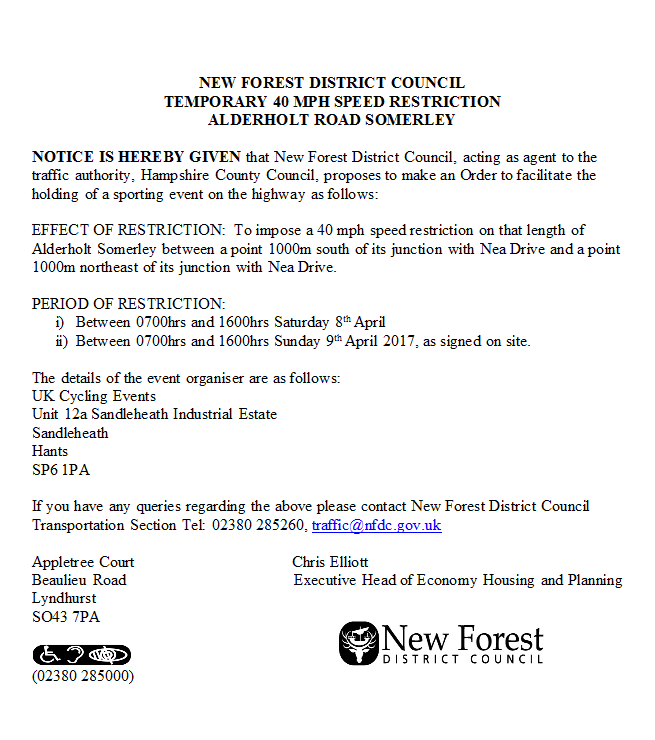 Please note the times and duration, this will affect those who use the road out to the A31. Posted on August 30, 2017 by Richard Loader	in Our Roads and Road closures (temporary). Posted on March 14, 2017 by Richard Loader	in Our Roads and Road closures (temporary). 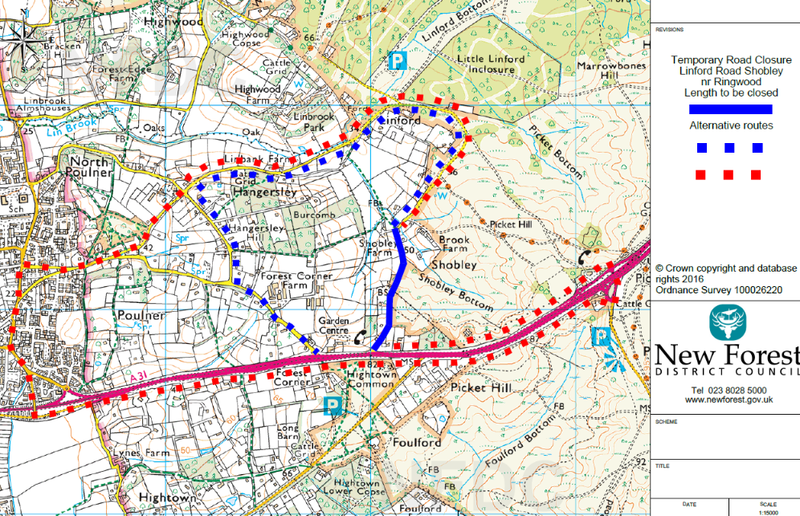 Temporary road closures Toms Lane and Gorley Road. Posted on February 6, 2017 by Richard Loader	in Our Roads and Road closures (temporary). PROBLEMS ON THE A31? HAVE YOUR SAY! Posted on June 21, 2016 by Richard Loader	in Our Roads and Road closures (temporary), Surveys - your views. Are you fed up of sitting in traffic on the A31? Is your road used as a rat-run when the A31 is busy? Are you affected by traffic noise or pollution from the A31? If the answer to any of these questions is YES, then now is the time to have your say! Highways England, which is responsible for the strategic road network (including the A31) is seeking your views on issues that affect you. They are in the process of gathering evidence of issues such as congestion, disruption on local roads as a consequence of the road network, litter hotspots and noise, as well as trying to identify future challenges. This is an opportunity to make your views known, identify where improvement is needed, and have an input into where government invests in the strategic road network up to 2025. Information is being gathered via an online mapping tool, where specific issues can be pinpointed to an exact location or an entire stretch of road. Have your say at www.highways.gov.uk/route-strategies/ by the deadline of 1st July 2016. 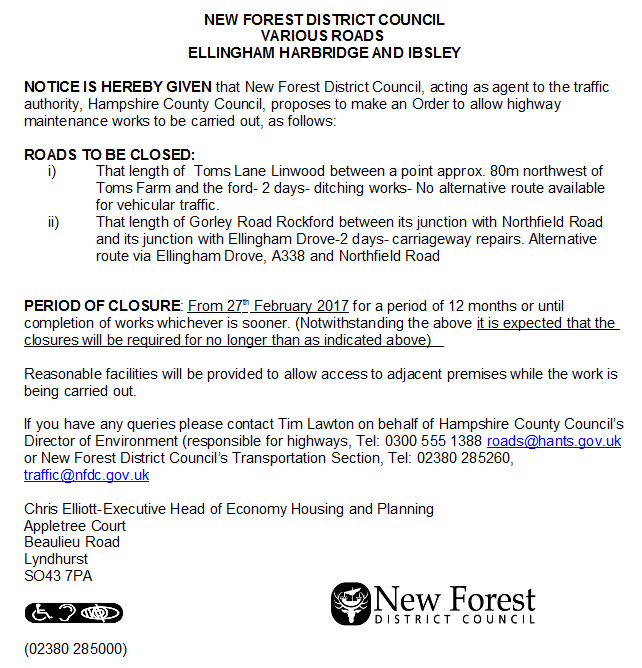 Temporary Road Closure – Linford Rd. Posted on June 1, 2016 by Richard Loader	in Our Roads and Road closures (temporary). ROAD TO BE CLOSED: That length of Linford Road Shobley Nr Ringwood, between its junction with A31 Poulner Hill and a point 650m north of that junction..
i) From the northern point of closure northeast and west via Linford Road to its junction with Christmas Tree Farm Road ; southeast via Christmas Tree Farm Road to its junction with Hangersley Hill; southeast via Hangersley Hill to its junction with A31 Poulner Hill; east via A31 to the southwestern point of closure. 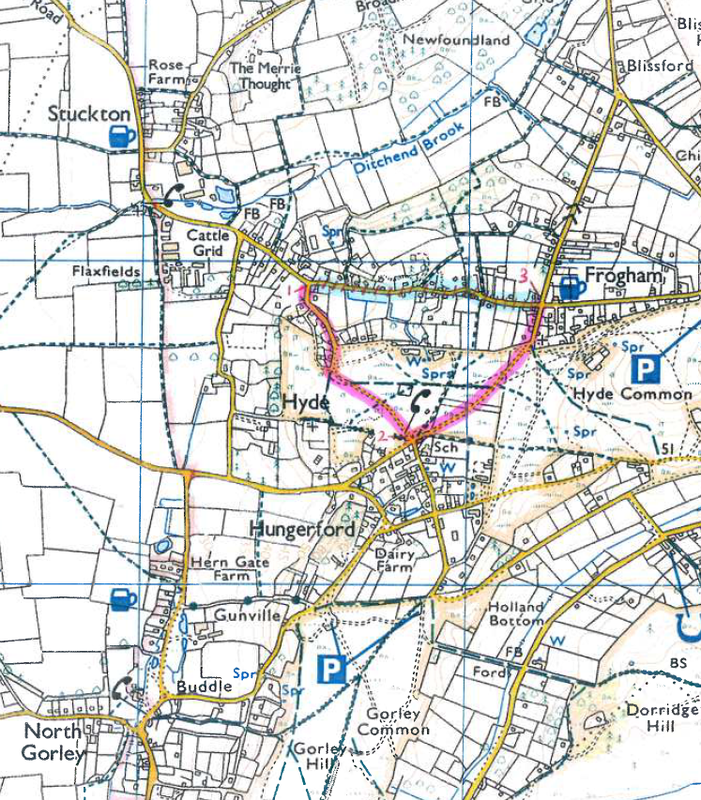 ii) From the southern point of closure east and northeast via A31 to its junction with A31 off-slip at Picket Post; northeast via off-slip to its junction with C10;south via C10 to its junction with A31 on-slip; south west via on-slip to its junction with A31;west via A31 to its junction with A31 off-slip at Poulner;west via off-slip to its junction with C49 Southampton Road ;northwest via Southampton Road to its junction with Gorley Road; northeast via Gorley Road to its junction with Linford Road; northeast and southwest via Linford Road to the northern point of closure. Posted on October 13, 2015 by Richard Loader	in Our Roads and Road closures (temporary). ROAD TO BE CLOSED: That length of Ivy Lane, Blashford, nr Ringwood between its junction with A338 Salisbury Road and its junction with C159 Gorley Road. From the eastern point of closure south via C159 Gorley Road to its junction with Northfield Road; west via Northfield Road to its junction with Old Salisbury Road; northwest via Old Salisbury Road to its junction with A338 Salisbury Road; north via A338 to the western point of closure and vice versa. Posted on October 5, 2015 by Richard Loader	in Our Roads and Road closures (temporary). Linwood Road between its junction with Toms Lane and its junction with C159 Gorley Road nr Rockford. Alternative route via Ellingham Drove ,A338 Salisbury Road and slip road at Fordingbridge; B3078 Southampton Road and Roger Penny Way, Longcross Plain Road,Janesmoor Plain Road ,Broomy Plain Road and Linwood Road. 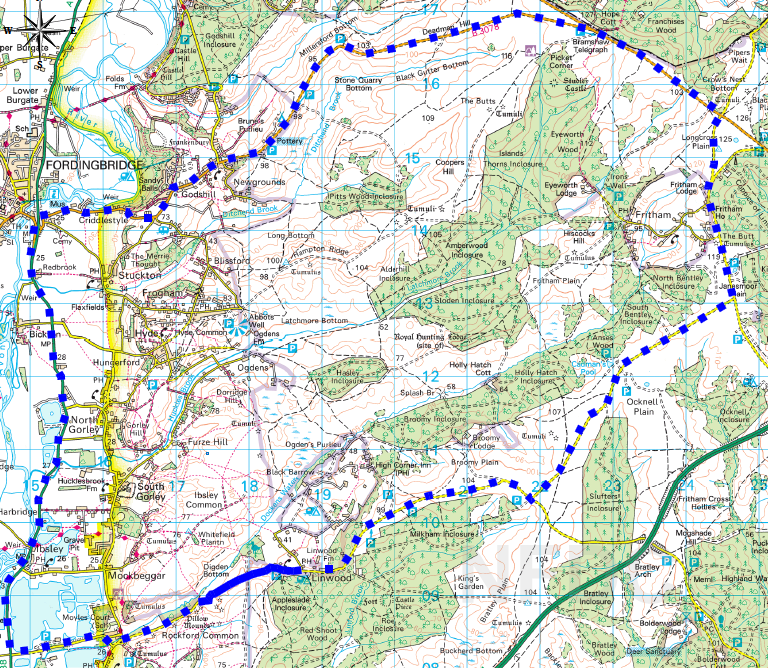 The closed section is in blue, solid and the diversion is blue dotted below. Frogham Hill between its junction with Pentons Hill and its junction with Blissford Hill. 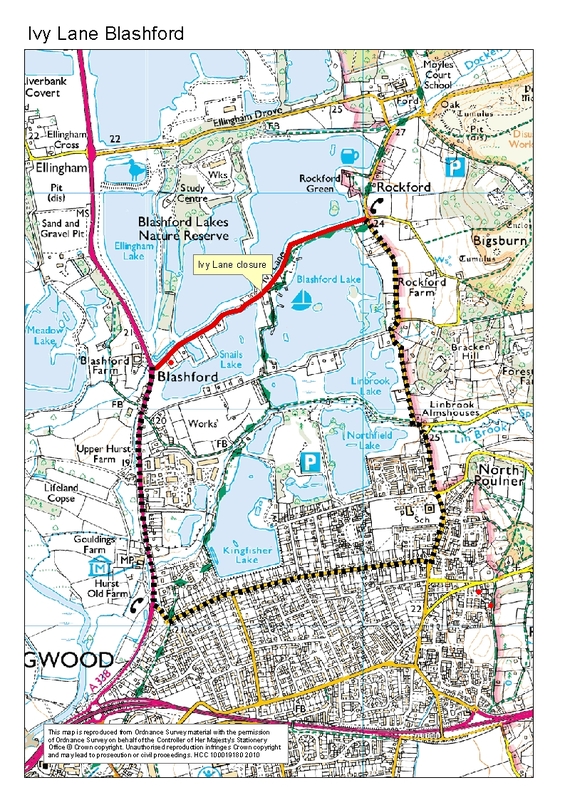 Alternative route via Pentons Hill and Blissford Hill.